President Millard Fillmore for Kids: "The American Louis Philippe"
Summary: Millard Fillmore (1800-1874), nicknamed the "American Louis Philippe", was the 13th American President and served in office from 1850-1853. The Presidency of Millard Fillmore spanned the period in United States history that encompasses the events of the Secession era. President Millard Fillmore represented the Whig political party which influenced the domestic and foreign policies of his presidency. The major accomplishments and the famous, main events that occurred during the time that Millard Fillmore was president included the publication of Uncle Tom's Cabin by Harriet Beecher Stowe, 1850 Fugitive Slave Bill and Commodore Perry's Mission to Japan (1852-54) and the Treaty of Kanagawa. Millard Fillmore died of a stroke on March 8, 1874, aged 74. The next president was Franklin Pierce. The summary and fact file of Millard Fillmore provides bitesize facts about his life. The Nickname of Millard Fillmore: The "American Louis Philippe"
The nickname of President Millard Fillmore provides an insight into how the man was viewed by the American public during his presidency. The meaning of the nickname the "American Louis Philippe" refers to the elegant clothes worn by Louis Philippe, King of France (1830 - 1848). The disparaging nickname "Wool Carder" referred to one of his earlier jobs in a wool factory. The character traits of President Millard Fillmore can be described as genial, practical and logical. It has been speculated that the Myers-Briggs personality type for Millard Fillmore is an ISFP (Introversion, Sensing, Feeling, Perception). A quiet, easygoing character with a a "live and let live" approach to life. A perfectionist, loyal to values and beliefs. Millard Fillmore Personality type: Practical, action-oriented and considerate. in an interesting, short summary format detailed below. Summary of the Compromise of 1850: The Compromise of 1850 was attempt to smooth out differences between the slave states and the free states regarding the status of territories acquired during the Mexican-American War (1846-1848). The Compromise of 1850 allowed California to be admitted as a free state and the New Mexico Territory and Utah Territory with slavery was left to to the decision of the people in relation to Popular Sovereignty on Slavery, that asserted rule by the people. Summary of the Fugitive Slave Act 1850: The Fugitive Slave Act 1850 was enacted during the presidency of Millard Fillmore. The law was passed on September 18, 1850, as part of the Compromise of 1850 and as a concession to the Southern states, increasing penalties against fugitive slaves and the people who aided them. Summary of Commodore Matthew Perry's Mission to Japan: Commodore Matthew Perry's Mission to Japan used "Gunboat Diplomacy" to open diplomatic and trade relations between the United States and Japan. 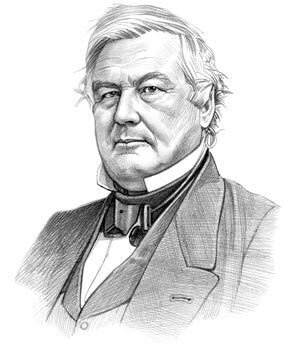 President Fillmore initiated the mission to Japan by because the annexation of California had created an American port on the Pacific enabling easier access to Asia. The development of steam powered ships allowed faster access to distant ports making the lucrative trade with Japan more viable. Summary of the Treaty of Kanagawa: The Treaty of Kanagawa was signed on March 31, 1854 by Commodore Matthew Perry and Shogunate representatives of the Japanese government signaling the end of Japanese isolation. The famous anti-slavery book, Uncle Tom's Cabin by Harriet Beecher Stowe was published in 1852 during the presidency of Millard Fillmore. The characters featured in Uncle Tom's Cabin personalized the political and economic arguments about slavery and convinced the people of the North that bounds had be set to the extension of slavery. The article on the accomplishments of Millard Fillmore provides an overview and summary of some of the most important events during his presidency. The following Millard Fillmore video will give you additional important history, facts and dates about the foreign and domestic political events of his administration.